This week, Surfin' considers how Internet social networking connects with ham radio. UPDATE: Below are the e-mails I received regarding this installment of Surfin' and further below are the comments. Stan, I'm looking at your "Amateur Radio meets social networking" article and wonder if you saw the week-long opportunity that starts tomorrow. It could be an interesting, short-fuse "QST" exercise to mobilize all hams in CONUS in support of a collective goal... and get DARPA to document amateur radio's contribution and capabilities. My signature says it all. I have enjoyed the social networks a lot. I can tweet “listening on 14.275”, or “going mobile listening on echolink 149493 and IRLP 7060” and have made quite a few contacts this way. Also rather then looking through dxclusters, I just simply look at my twitter feed for dxanywhere and instantly I can see what bands are open. I am not sure if this is a unique use of Twitter or not, but I use it to send out notices of new blog posts. When ever I write a blog post I also send the title and a direct link to the post in a tweet. I originally didn't want to use it, but my brother is in advertising and steigic communications and said it would be worth it. I don't use any of the online applications these days to write about every little detail of my life and what is going on - I don't think that is necessary. The way some people use Facebook and Twitter is a little out of hand, in my book. The way in which I use them is very laid back. I am not all over either one. 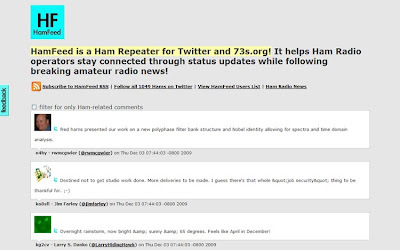 I just saw your 12/4/2009 article on the aarl.org site titled "Surfin': Twitter, Facebook and Ham Radio". I thought I'd share some of my social networking things. So, I have a facebook account(http://www.facebook.com/makikato) and I also manage the MVARC's club page. Most of our members are not on Facebook (yet) so there isn't much there, but I'm hoping it'll at least have some presence for our club inside Facebook land. I must admit some of this is just one big learning experience :-) And Facebook isn't the most intuitive user interface. I'm a builder, and want to learn more about electronics and homebrewing so I spend a bit of time looking for things to read on the 'net. All that gets culminated in my delicio.us account. I tell my friends they can pretty much follow me by looking at my delicio.us account. One of the interesting ways of using delicious I found is to look at the links of others who have bookmarked the same pages as you, and find things in their bookmarks that you've never seen. Recently I've been putting together a MOuSeFET transmitter with a friend of mine Craig NC4P, and we're keeping track of the conversations we have in a Google wave conversation. If you'd like to have a look send me your google wave account. If you don't have a google wave account let me know and I'll send you an invite. I don't really use facebook and actually as I could not find a use for it... deleted my account but I have been experimenting with twitter. Recently there have been some Amateur Radio Operators (WG0AT and VA3SIE) beaconing their locations and operating frequency over APRS with a Twitterlink when out on mini DXPeditions such as the recent Summits on the Air (SOTA) activity weekend. Hope these comments help you in your article. I read your Surfin': Twitter, Facebook and Ham Radio Internet social networking (ISN) article and was glad to see an article written about this topic as we need to shed new light on to our amatuer radio community. After dwelling on it for awhile I truly believe that ISN's will provide hams with a new generation of powerful tool applications to help aid amateurs with our hobby from this point on. But the first step to this success will have to be amateurs not being procrastinators. We first need to educate ourselves first with these new services. We need to embrace and take full advantage of them today rather then tomorrow. condition alerts or chat when conditions are not that favorable. This above site is a great with all it's useful links if you have a net connection while your in the field or mobile using your portable PC that has a web browser to access the link. What do you do if you do not have that option but would like to communicate when tropospheric and sporadic-e exists at your location in real-time? If you have cell phone service, then you just found the answer. To use it with your phone you will first have to download a client service application(s). Go ahead and give these new services a try. Thanks so much for your coverage on 73s.org and HamFeed.com! We received an influx of new members registering today! Nice that the ARRL posts this. I found it odd, though, that the *esteemed* President and Grand Poobah Joel Harrison put my TWIAR Twitter on his ignore list back around the time of Hamvention. Amazing how that one little move prevented me from renewing my membership after 15 years as an ARRL member.